4 Bedroom Detached House For Sale in Hook for Guide Price £635,000. A four bedroom detached home with no onward chain. The property is situated in a secluded cul-de-sac in Hook village yet just 1 minute walk from the schools, 5 minutes walk from the village centre, 7 minutes walk from the train station and 1 mile from junction 5 of the M3. 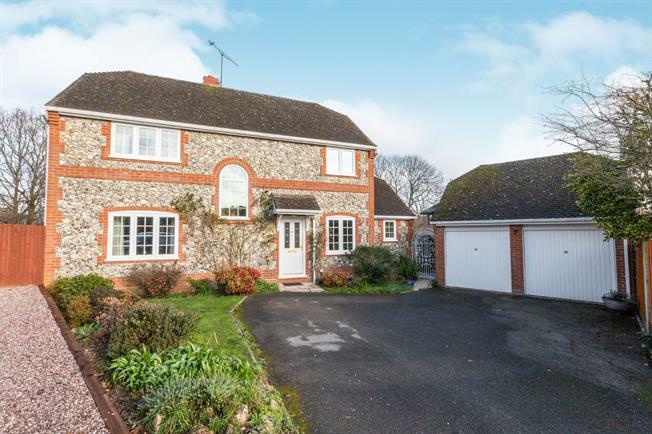 This attractive property is a rare brick and flint house and has garden with a field on two sides and is not overlooked. The central hallway leads to a large triple aspect lounge with working fireplace, dining room, study, downstairs wc, kitchen with adjoining breakfast room and a separate utility room. Upstairs there are four double bedrooms with an ensuite shower room to the master and a family bathroom. Outside there is a double garage, substantial off street parking and a good sized garden. takeaways, garages and a church. Hook has fantastic transport connections with a direct train line to London Waterloo or the West, the M3 providing access to Heathrow airport in 27 minutes, to the M25 and London or to Winchester and Southampton. Reading is 11 miles North providing access to the M4 and a mainline station to London Paddington.